Whenever I talk to writers I ask if they belong to a writing group. I am amazed that, most of the time, the person responds with 'no'. Sometimes it's a horrified 'no', and I feel as though I've asked them whether they run a dog fighting ring in their basement. Sometimes it's a guilty no, as though they're confessing to not eating their broccoli or reading the latest James Patterson thriller (I feel I should mention that I've read one or two; I tell myself it's research). Being the curious person that I am (in both senses of the word) I ask them, 'why not?' The horrified ones are usually afraid someone will give them negative feedback and they'll get writers block and the guilty ones feel that they should belong to a writers group because all serious writers do and it would be a great way to make contacts but they don't feel their work is quite up to snuff yet. They want to hold off joining one until they're just a wee bit better, until they've had a chance to give their stories one more polish. 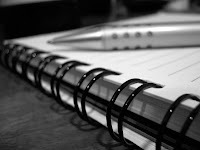 I realize that what a writers group does for me may be very different from what it does or will do for anyone else, and that different people want different things out of writers groups, but, still, I think that both these groups of people have missed the point. I think that the single most important function of a writers group for the beginning writer is to let them know that other people take your work seriously enough to not only spend their precious time reading it, but to give you their honest thoughts about it. In my experience honesty tempered by kindness is a rare thing but that is what I have found in my writers group. To the horrified writers I want to say that seeing your story through the lens of another's soul is worth the occasional sobering comment, and to the shy writers I want to say that joining a writers group is about agreeing to work together to help each other become better writers -- or something like that. Please don't hold off until you feel that your work is good enough, a writers group is just what you need to help you hone it. In the end, we write for ourselves but we also write for readers. Knowing what other people think of my writing has been an enormous help. So, if you're a writer near the beginning of your career and you're not part of a writing group, what are you waiting for? Join one! Caveat: I'm lucky to belong to a writers group that is a good fit for me. Some say that belonging to a writers group that is NOT a good fit for you is worse than not belonging to a group at all. Personally, I think that -- especially with the internet -- there is a group out there for every writer, it just might take awhile to find one that is a good fit for you. Don't give up. This is a great post. I started my own writers' group a couple years ago and it's been such a great experience. Finding the right fit is definitely important. You want a group of honest but sensitive critique partners. I don't believe in tearing work apart or destroying someone's self-confidence. Writing is hard enough as it is without that. It's all about constructive criticism. Thanks Alana! It's great to hear from someone who took the initiative and formed their own writers group. It is great to hear that, two years later, things are still good. Karen - one of the first things I say to writers at the beginning of their careers is that, because writing is so solitary, it's almost crucial to join a writing group. You may have to try two or three or four before you find the right one, but having someone who understands when you obsess for days over a comma can save your sanity! Thanks Kate, it's great to get advice from someone who has been doing this for awhile! Love your books. I have been a part of several writing groups throughout the years and yes, I am a published writer. But recently one of the PRINT ON DEMAND publishers called me regarding a manuscript that I had submitted. He offered to publish my book for (first print - ebook and i copy - over $4000) in which i declined and told him I was awaiting a traditional book publisher to either accept or reject my work. He was very perturbed and asked if i was part of a writers group in which I said 'yes'. Then he put down writers groups and said that they were the 'blind leading the blind' and since i was a no-body no traditional publisher would ever consider my work. i still declined. Guess what? One day later Harlequin Books emailed me asking for the first 3 chapters and sypnosis of my romance book - there is a God and he must love me!!! Anyway- I don't know yet if they will accept my manuscript but I have my toe in the door and I'm not giving up because of something some guy wanting my hard earned money said to me. We may be blind but we're not stupid! Anyone else feels the same way, let me know! There are many scam artists out there, I'm glad this one didn't get anything from you. There's only one rule in writing: writer's write. Whether you go the traditional or indie route is up to you, both are viable.